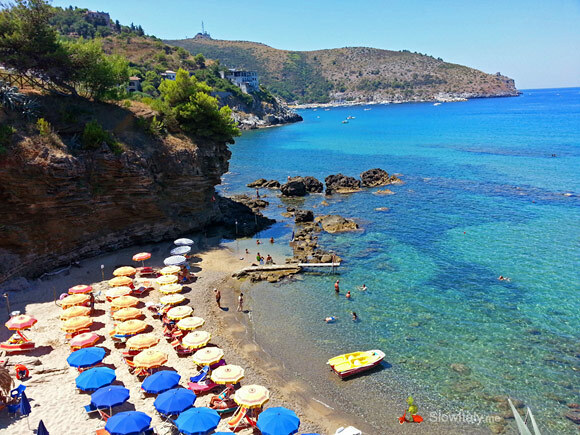 Palinuro is a small coastal town with a special atmosphere, almost out of time, located on the beautiful peninsula of Capo Palinuro within the Parco Nazionale del Cilento. 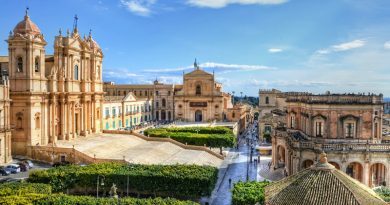 The lovely seaside town makes an ideal base from which to explore the Coast of Myth and the Tyrrhenian part of Basilicata. 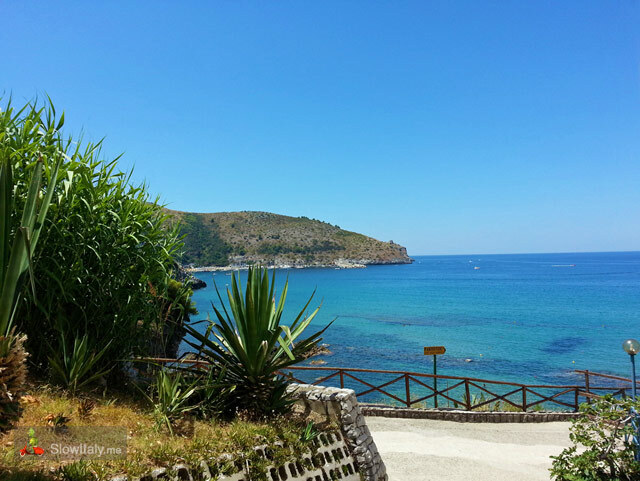 The area in and around Palinuro is a mix of beautiful sandy beaches, unspoiled nature, turquoise waters, narrow winding streets, jaw-dropping views over the coast and authentic medieval hamlets in the hinterland. 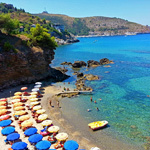 Spiaggia Ficocella - Ficocella beach, Palinuro. Photo © Slow Italy. 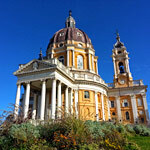 Although the town is popular with tourists, it is not nearly as touristy as the nearby Amalfi Coast. 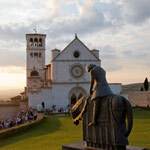 It is easy to avoid the crowds, which mostly gather in the streets at night after dinner time. 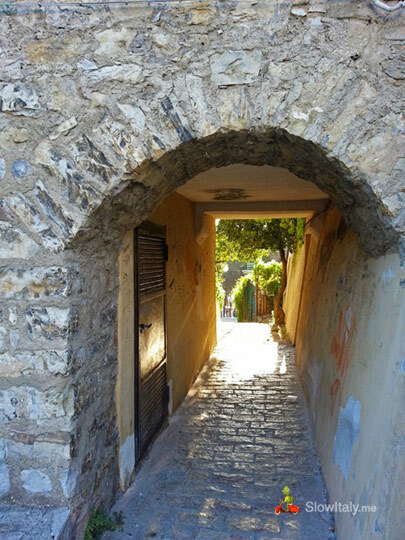 In the mornings and afternoons we had the town all to yourself (even though we stayed there in August). 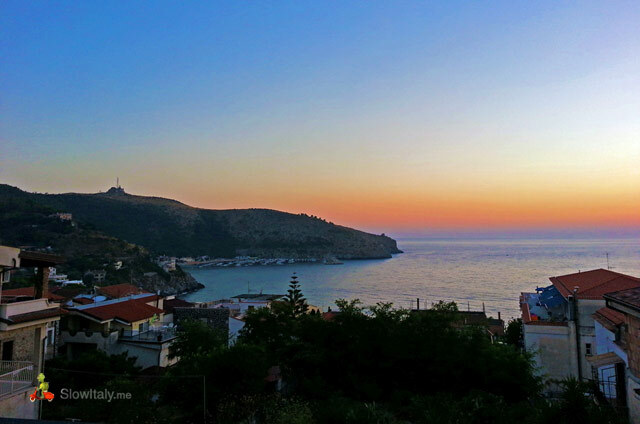 As soon as we arrived, and had a first glimpse of the stunning view over the coast from the terrace of our hotel, we immediately felt we would easily settle into the peaceful atmosphere and slow pace of the town. View from our hotel. Photo © Slow Italy. 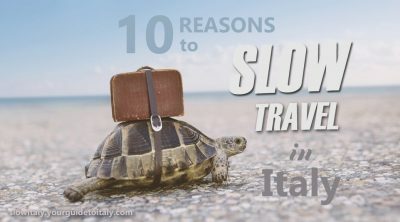 “Slow pace” does not necessarily equate to “being inactive”. 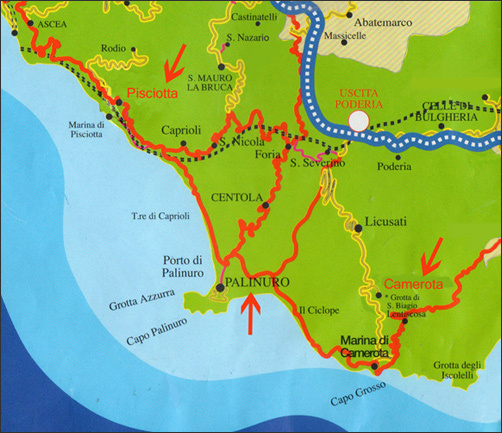 Palinuro forms an ideal base for an active or relaxing vacation, with many choices for interesting half-day or one-day excursions nearby. 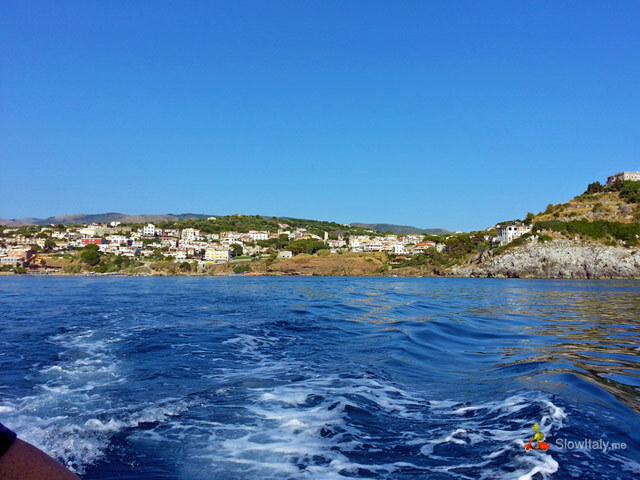 Whether you are into leisurely hikes, historic hamlet hopping, boat touring, scuba diving, or just beach chilling, you will find yourself at home. 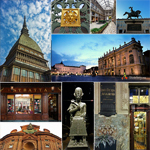 And, for those of you who enjoy good food and fine fish dining, there are a few really good restaurants, and of course, plenty of delicious cilentan food specialties to try. 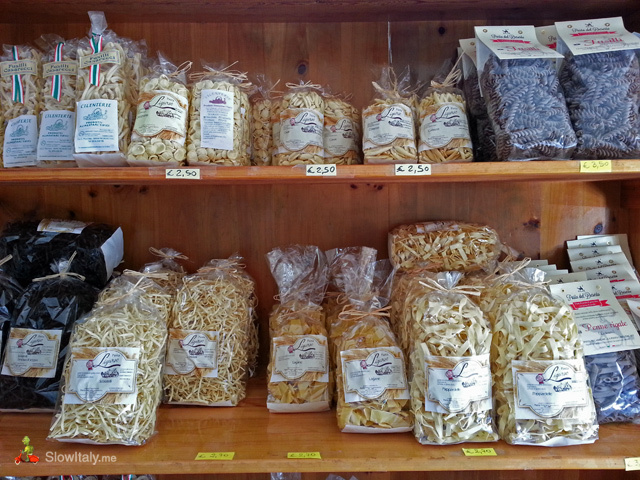 Typical pasta types of the region are: lagane, fusilli and cavatielli. 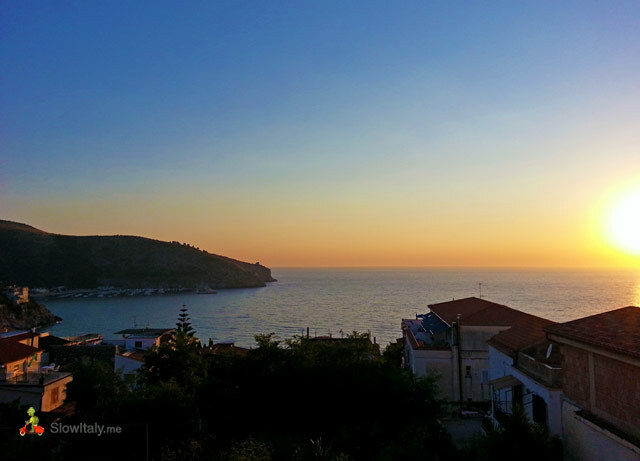 The sunsets over Capo Palinuro and Porto Palinuro are nothing but spectacular, night after night. 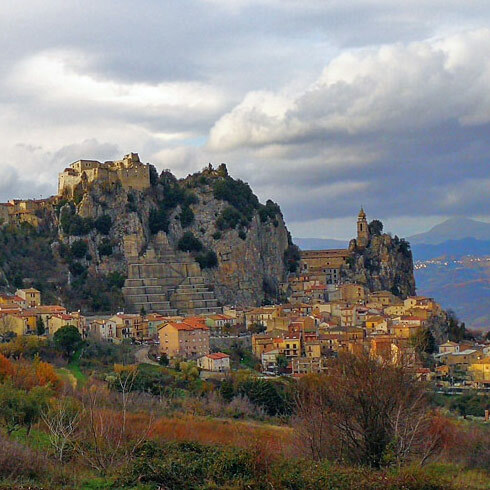 The name of the town Palinuro is linked to Palinurus, a character of the Aeneid, the epic poem written by Virgil, which describes the mythical events that took place before Aeneas founded Rome. 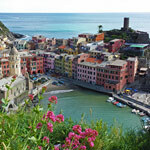 Hence why the coast here is also known as the Costa del Mito (Coast of Myth). Palinurus was the helmsman of Aeneas. However, etymologically it is not the cape that was named after Virgil’s character, but the other way around; the cape gave its name to the character of Palinurus. Indeed, the name of the cape derives from the Greek words palin (‘in the opposite direction’) and ouros (‘wind’), referring to the violence of the winds around the cape on stormy days. It is said that Virgil named his character after the many anonymous sailors who shipwrecked here. 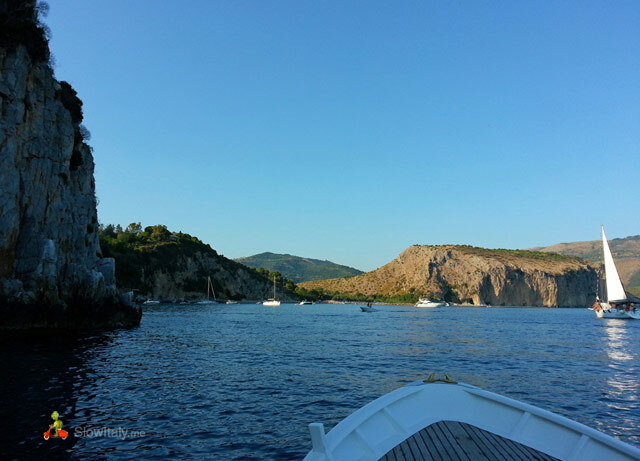 We chose to take a boat tour on our second day to visit the magnificent grottos scattered around the coast of the hand-shaped Palinuro Peninsula. 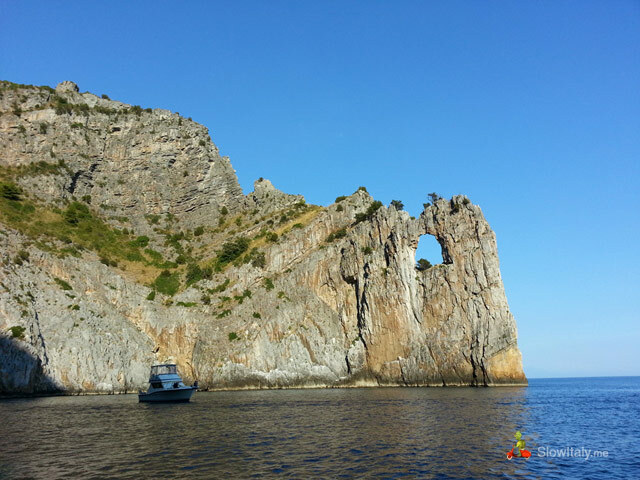 Pick a tour that takes you from the Grotta Azzurra (the most beautiful one) to the Arco Naturale, with stops at the Grotta del Sangue, Grotta Sulfurea, Grotta dei Monaci, Cala del Buon Dormire, Grotta delle Ossa, including the Scoglio del Coniglio and the Arco naturale, with some free time to swim at the Spiaggia del Buon Dormire or near the Scoglio del Coniglio (which I definitely recommend). 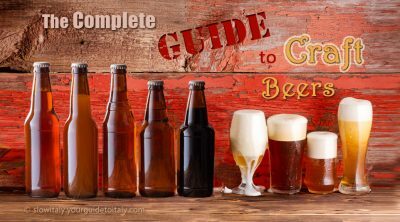 See our tips at the bottom of this article. 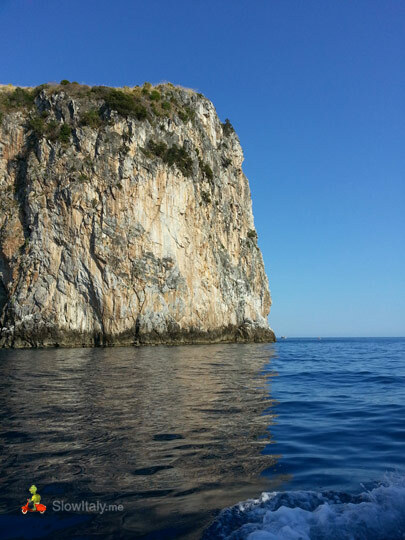 Our boat tour left from Spiaggia Ficocella, with a first stop at the Grotta Azzurra, the most beautiful of all Palinuro grottos. 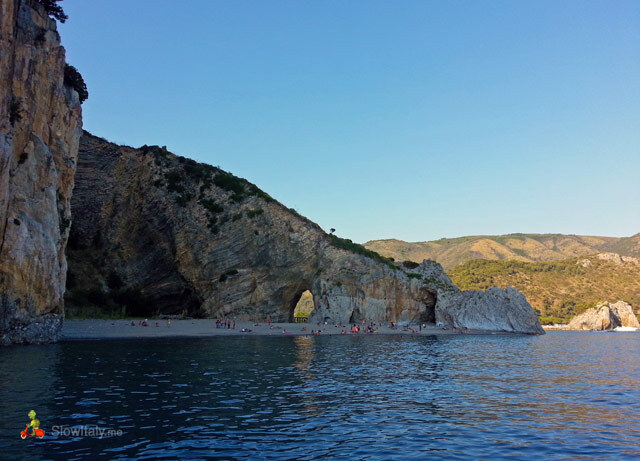 The grotta Azzurra is the only one facing North on the Palinuro peninsula and the most famous and spectacular one of the Palinuro caves. 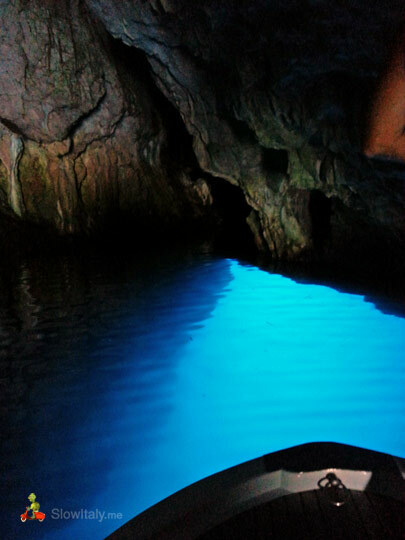 The surprising sapphire blue light that colors the water of the grotto comes from the sunlight that enters the cave from two sides, creating a brilliant blue color luminescence. 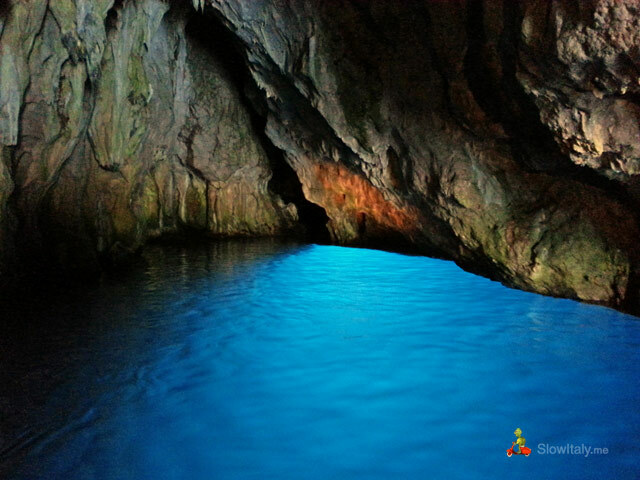 Like in Capri’s Blue Grotto, the light is filtered by the water which absorbs the red tones, leaving only the azure ones to pass into the cave, creating the amazing effect you see on the photos below. Punta Spartivento. Photo © Slow Italy. Finestrella. Photo © Slow Italy. Entrance of the Grotta del Sangue. Photo © Slow Italy. Grotta del Sangue. Photo © Slow Italy. Next comes the Grotta del Sangue. 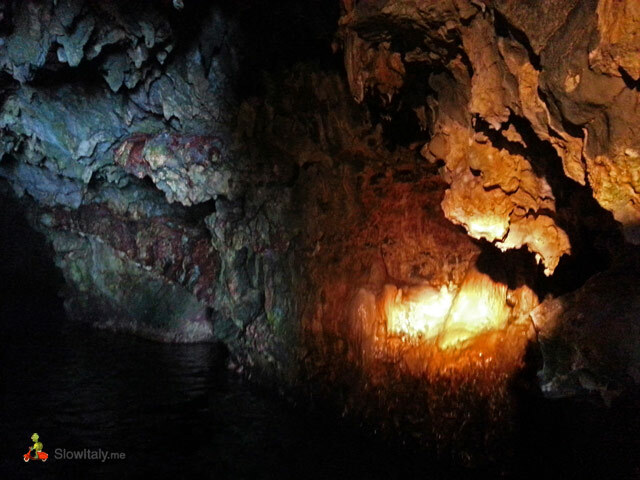 The walls of this grotto contain a lot of iron, which, when entering in contact with sea water, give it its intense red color, hence the name: ‘blood cave’. At the back of the grotto, on the right side, a group of stalactites have formed into a kind of altar where the deposit of this red substance is particularly dense and intense, creating the illusion of blood dripping off a sacrificial alter, which, of course, has given rise to obscure legends. The Grotta dei Monaci (Monk cave), like the other grottos, contains many stalactites and stalagmites, some of which have grown together in such a manner that they seem to represent a group of monks. 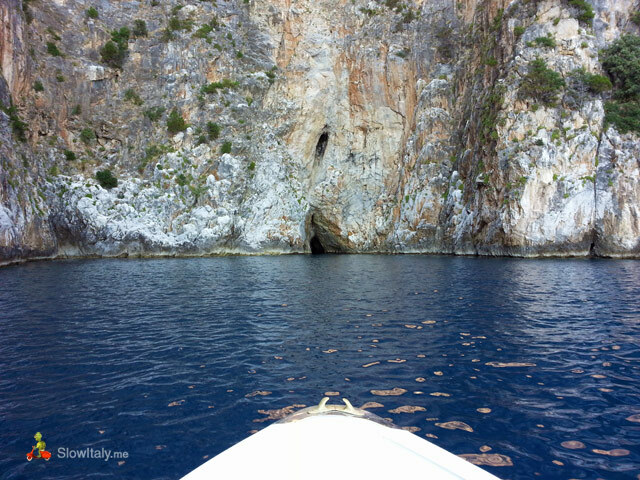 The Grotta Sulfurea is only visible from the outside, but non less characteristic due to the presence of sulphur. In the deep waters one can still find sulphur bacteria, organisms that date back to the origins of our planet and can survive without oxygen. A favorite among scuba divers is the Grotta d’Argento (Silver Cave), due to the natural fauna present in this natural cathedral of colors. The cave got its name from the way the light sparkles and reflects on the surface of the water. 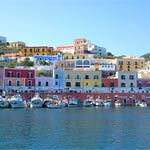 In the evening or on a Saturday morning the nearby medieval hilltop villages Pisciotta or Camerota make an ideal destination for a short excursion. 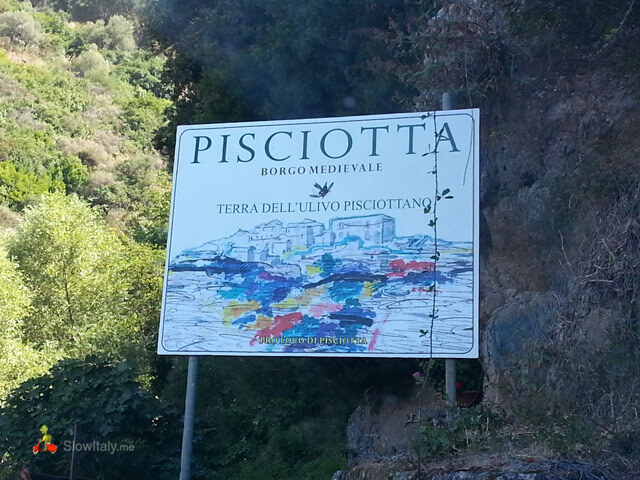 Pisciotta is a charming little town with an ancient borgo. 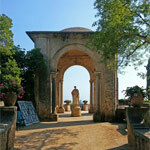 Although it is close to the coast, it is still relatively unknown and not overrun by tourists. 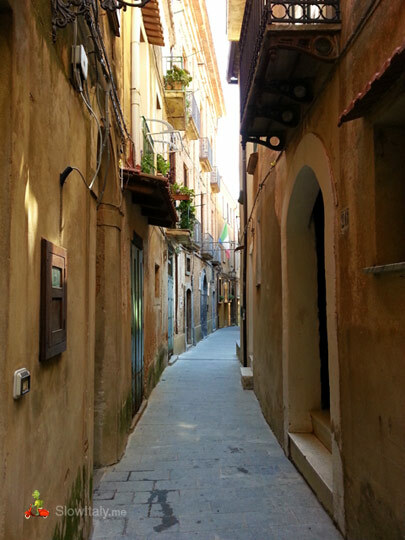 During the day you have the borgo mostly to yourself, which is wonderful. At night there are a couple of nice restaurants and bars to explore. 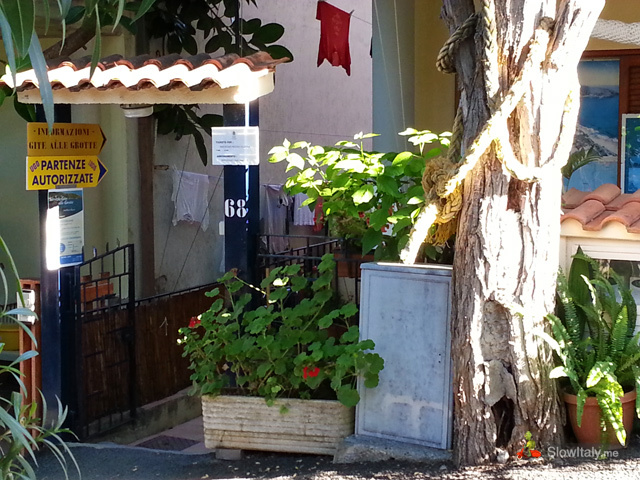 Restaurant in the old borgo. 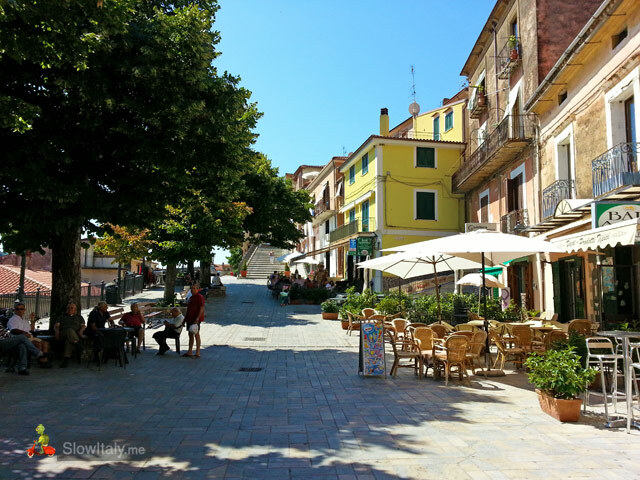 The center of the town and the borgo are car-free, so you will have to leave your car outside the center. 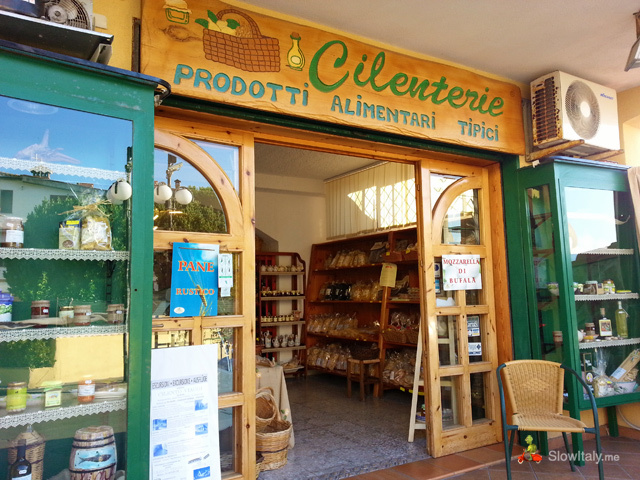 We visited Pisciotta on a Saturday while there was a lovely small fruit market on the stairs leading to the church. 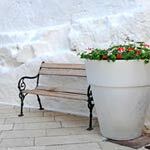 The outdoor tables of the caffè in front of the church are also lined on these same stairs, amidst the vendors selling there local fruit and vegetables, which gave the setting a charmingly local flavor. 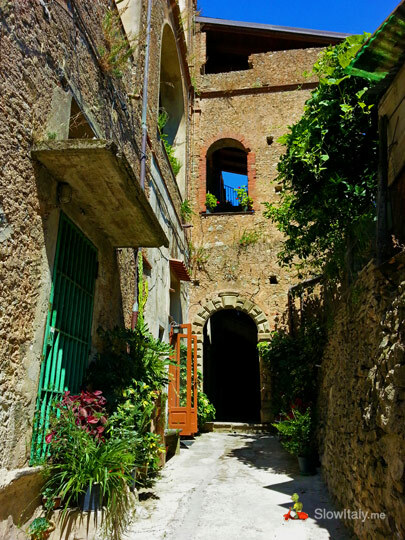 Opposite the church are the stairs leading to the borgo. 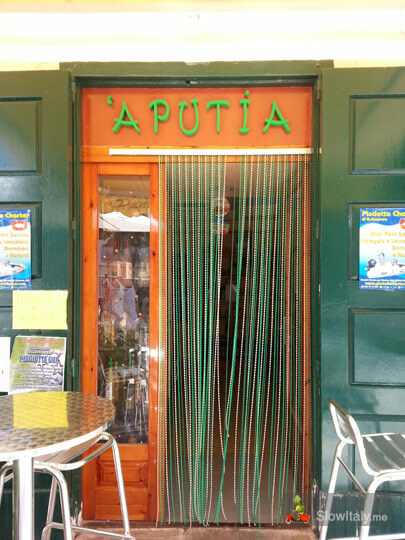 On Piazza Raffaele, just before those stairs, there is a small shop ‘A Putia, selling delicious local specialties. 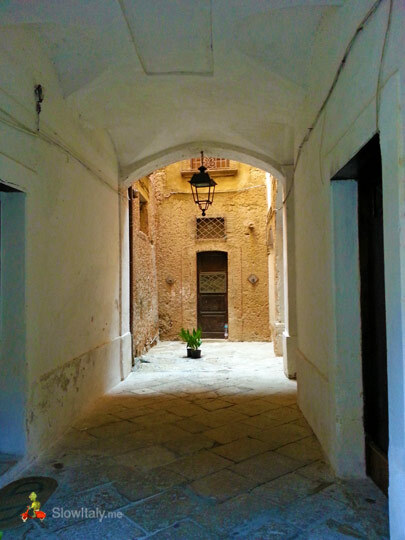 As you slowly walk the narrow alleys of the borgo you can really begin to imagine how life must have been here centuries ago. 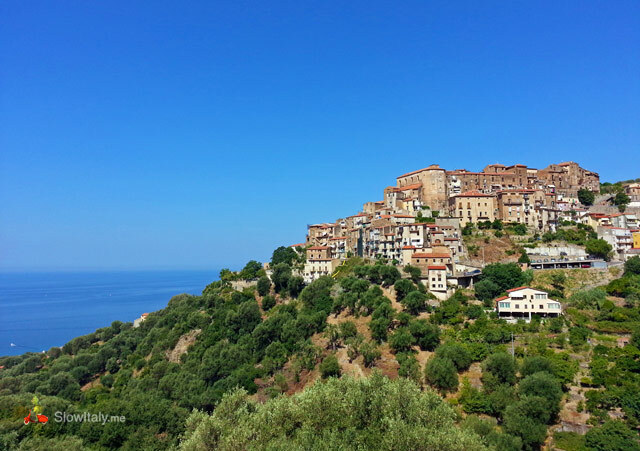 On another day we visited Camerota, which is a little further from Palinuro (about 30min by car) and definitely worth a visit, too. 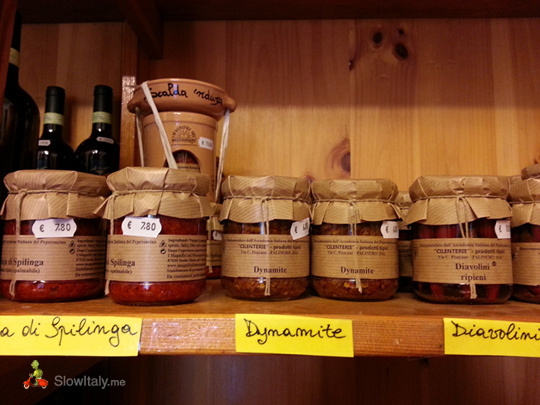 See our article and photos about our visit to Camerota. 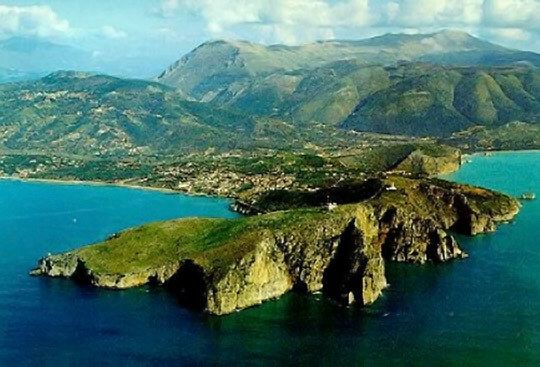 Then, still a little further away there is the scenic road worth exploring, going from Sapri to Maratea. 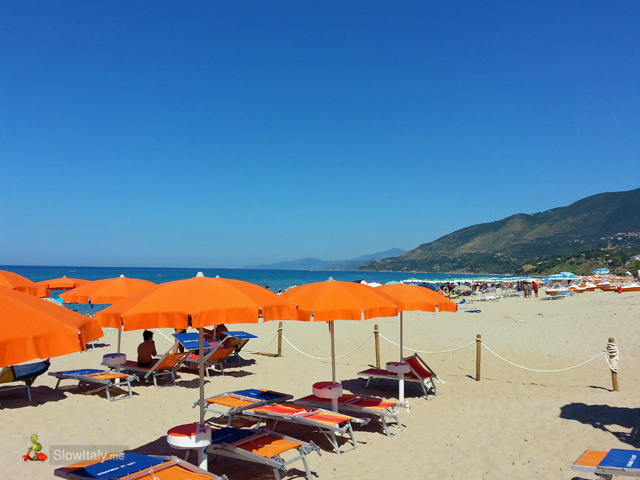 See our article about Maratea. 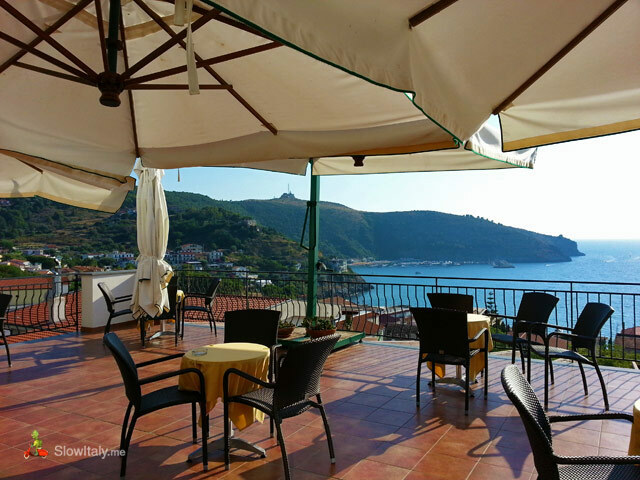 We stayed at Hotel La Conchiglia, a family-run hotel (even though it is part of the Best Western chain) with an exquisite location offering amazing views and sunsets over Capo Palinuro and the coast. 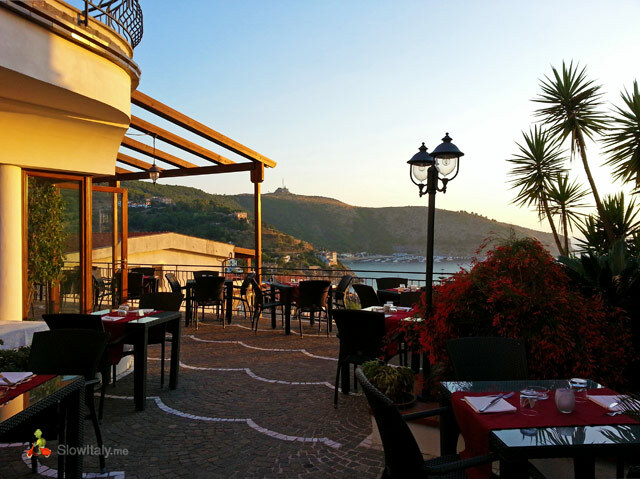 The hotel has an excellent restaurant with a beautiful terrace, ideal for a romantic or relaxing dinner. 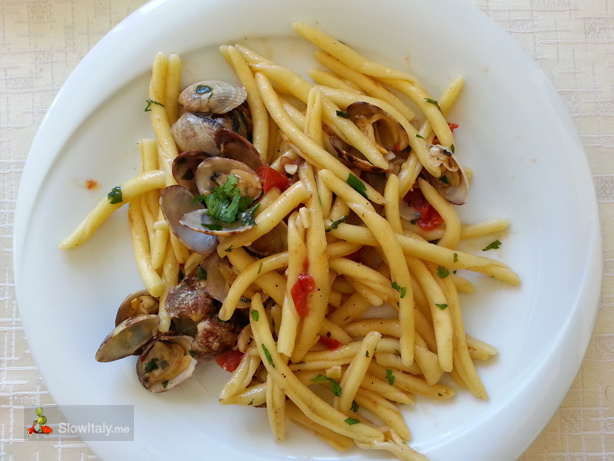 For a refined dinner we recommend Il Vicoletto, which is actually the restaurant of Hotel La Conchiglia. 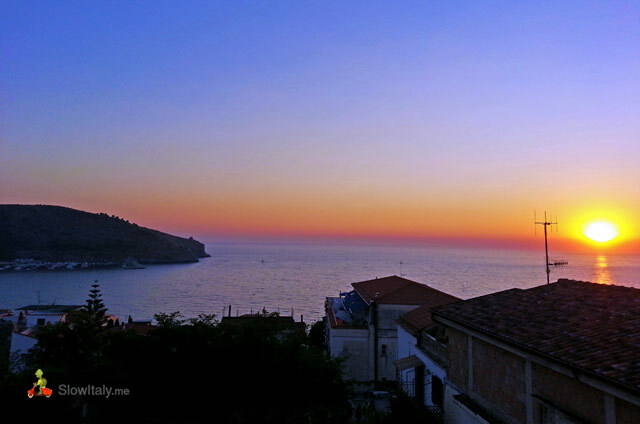 It has a spectacular terrace overlooking the coast (see photo above), good food and wine, and great service. 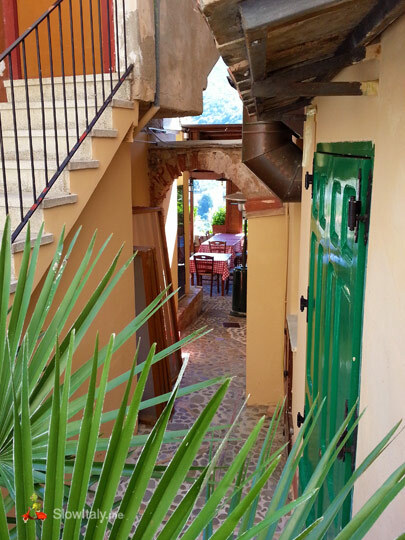 For a more casual lunch or dinner and very good food we recommend restaurant La Pergola dal 1977, on Via Carlo Pisacane, the street parallel to the main street, probably one of the best value for money in Palinuro. 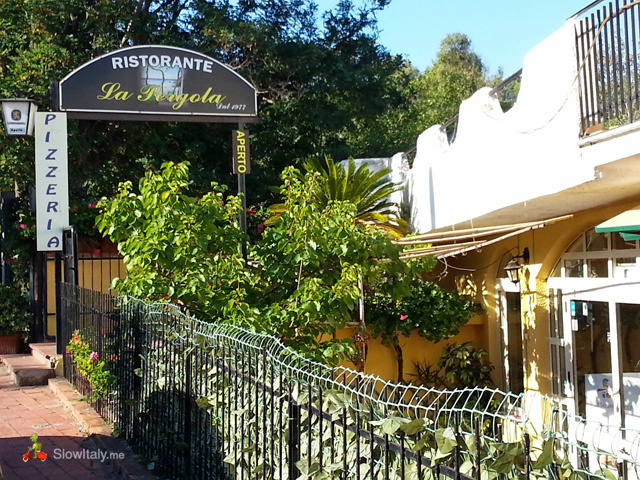 They have very fresh fish and seafood and excellent primi (pasta dishes). 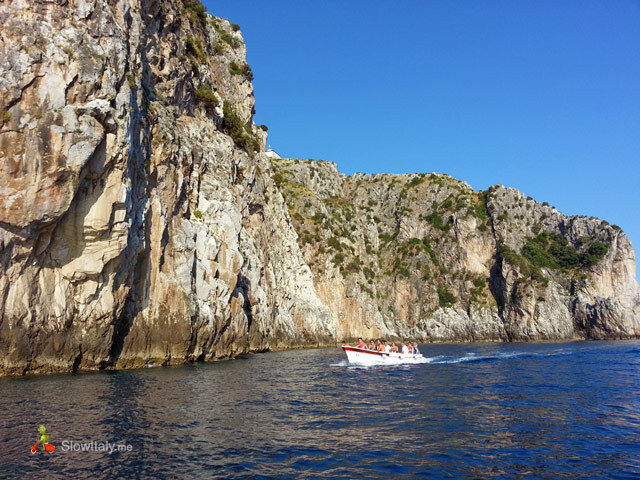 For a very pleasant and interesting 2-hour boat tour of the grottos, we recommend ‘Ugo e Lucio’, booking: Via Ficucella, departure: Spiaggia Ficocella, tel: 0974/931267 – 3407193072. 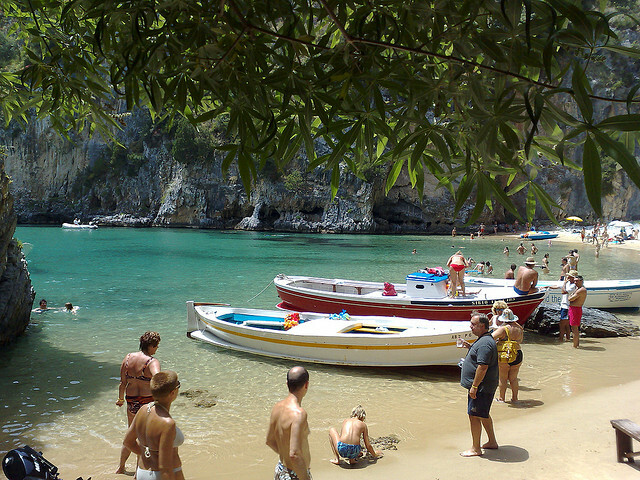 Cost is 15 euro/person based on an occupancy of 16 passengers per boat. 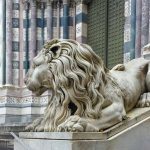 However, if you are traveling with a group of friends or larger family, you may want to hire the entire boat to have it all to yourselves. This will allow you to do the tour at your own rhythm, spending maybe more time in a specific area and less in another. I particularly recommended this option if you intend to shoot good photos of the grottos, in which case you will need a little more space on the boat in order to not have hats and hands of other tourists popping up in front of your lens. 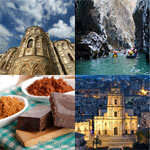 Some companies, like ‘Ugo e Lucio’, also accept to do private or family tours for a reduced price (i.e. without you having to pay for the ‘missing’ passengers), but only at specific times of the day. 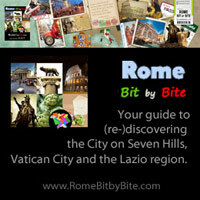 The best time to do the tour is around 15:00 in order to have all grottos and important bays sunlit at their best. 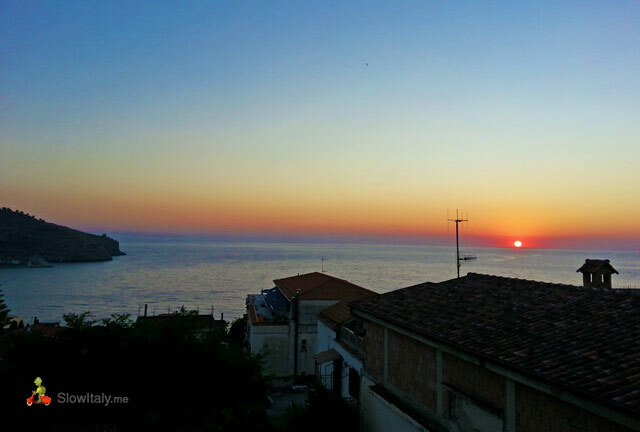 Photo credits (top to bottom): all photos © Slow Italy, except: Palinuro peninsula sky view by Very2000; Spiaggia del Buon Dormire by Alessandro.